Lion's Rest is a subzone of Stormwind City, built over the site of the former Park and Old Barracks, previously destroyed by Deathwing. After completing  The Fallen Lion, Lion's Rest phases and becomes a cenotaph for King Varian Wrynn after he was slain at the Broken Shore, as well as the site of a monument to Stormwind's fallen. The Uncrowned's Shadowblade, Taoshi, and Mathias Shaw sneaked through the area in order to get to the SI:7 building and reveal Detheroc. Lion's Rest is a place of contemplation and remembrance, a tranquil park dedicated in honor of those who have made the ultimate sacrifice on our behalf. The monuments surrounding the tomb are written in a variation of the real world runic alphabet, Elder Futhark. This is not the first time that Elder Futhark has been used to represent Common. 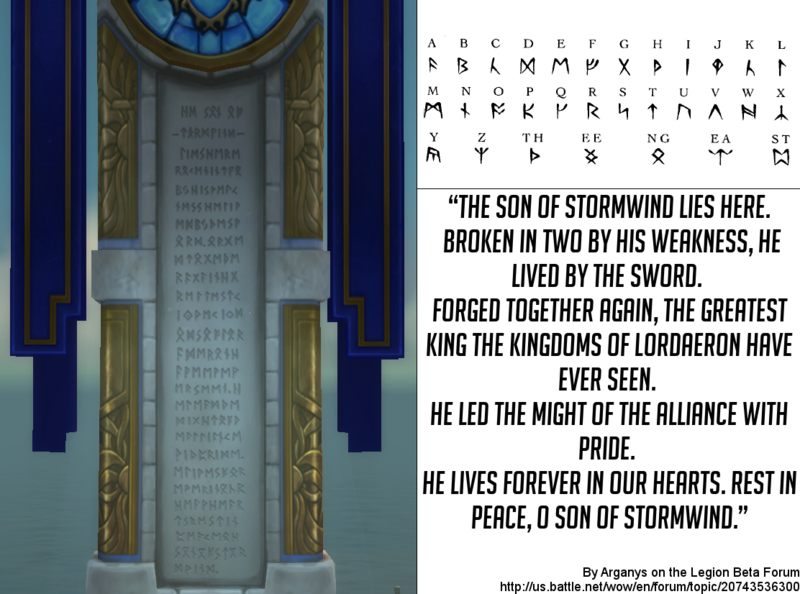 "The Son of Stormwind lies here. Broken in two by his weakness, he lived by the sword. Forged together again, the greatest king the kingdoms of Lordaeron have ever seen. He led the might of the Alliance with pride. He lives forever in our heavy hearts. Rest in peace, Oh Son of Stormwind." There is a sewer entrance to the Stormwind Stockade in the water here. This page was last edited on 1 November 2018, at 13:31.